Breeding dwarf hamsters can be an exciting and wonderful way to introduce the family, especially children to the joys of nature however there are many things to consider before embarking on the process. The gestational period for a dwarf hamster is typically between eighteen and twenty days and the size of the litter or the amount of babies they have can vary quite dramatically and anything from one baby up to ten babies should be expected. Once the babies are born it is especially important that owners leave the babies and their mother to get on with being a family. Owners should refrain from touching the babies and as hard as that may be it is critical that mother and babies are left to bond and learn about themselves and each other before being handled. Normally after a period of about ten days it will then be acceptable for owners to pet them and handle them, however not for too long as this could cause the mother to become anxious about her young and she may become distressed. Don’t worry about cleaning or changing the bedding for the first ten days, they will be absolutely fine and the mother will ensure they are kept clean. 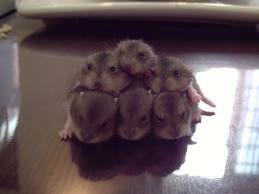 It will take about seven days before any fur will be seen on the babies. When they are born they do not come out with fur but after a period of about four days you will notice the pigment on their bodies will start to develop and then fur will start to appear. It will take about ten days for their eyes start to open and they start wondering around. Only after they have reached this stage are they safe to handle. Extra care will need to be taken when handling the baby dwarf hamsters as like their parents they are very jumpy and fast and can easily jump out of your hand. Now you have started handling them it would be wise to do this on a regular basis but only for brief periods. This will help to tame the babies and make them friendlier to humans. Baby dwarf hamsters will start to eat hamster food when they are about two weeks old and small portions of oatmeal, wheat germ and tiny pieces of bird seed should be introduced regularly. The babies will develop a lot faster when given small grains and in turn they will become a lot healthier. You could even introduce very small amounts of fruit or raw vegetables. At about ten days old you will notice that they will seek out the water bottle and start to take small amounts of water in. Once this happens the mother will start feeding them less and less and after about 4 weeks she will then stop feeding them altogether and the babies are now fully weaned and should be taking regular meals from the food bowl. It is at this point you will need to remove the babies and place them in their own cage. Especially if there are males in the litter because if they are not removed then it will be quite likely that the mother will become pregnant again and inbred pregnancies are not encouraged for various reasons. Place females in one cage and the males in another. Now they are four weeks old the dwarf hamster care in the previous article should be followed as they are at the stage where they are now fully independent. However you should check on them regularly if you have more than one in a cage as they are prone to squabbling just like human children and because of their delicate frame they can become injured. It is also at this stage when they are ready to be given away to friends or family or sold in pet stores.